To report two cases of flap melting over corneal inlays for hyperopic correction several years after implantation. The corneal inlay (+6.00 diopters [D]; PermaVision intracorneal lens; Anamed Inc., Lake Forest, CA) was implanted underneath a LASIK flap in two patients. Visual acuity and slit-lamp findings of both patients were stable for several years. At 9 years postoperatively, the first patient presented with a sudden loss of corrected distance visual acuity (CDVA) due to partial flap melting over the inlay while the surrounding anterior cornea showed opacification. The inlay was explanted immediately. Three years after explantation, CDVA returned to 1.0. Similarly, the second patient presented 11 years postoperatively with loss of vision, opacification, and partial flap melting. The inlay was explanted. Two years later, CDVA recovered. Potentially severe biocompatibility issues of corneal inlays may occur even after several uneventful years. In contrast to various subtractive laser procedures, the intracorneal implantation of inlays has been described as an additive way to correct hyperopia.1–3 We report two cases of flap melts above such corneal inlays occurring several years after implantation. Implantation of corneal inlays (PermaVision intracorneal lens; Anamed, Inc., Lake Forest, CA) with the maximum available power (+6.00 diopters [D]) was planned as partial correction without concomitant laser ablations. Preoperative Orbscan (Orbscan II; Bausch & Lomb, Rochester, NY) examination did not reveal any topographic anomalies or corneal thinning in any eye. A corneal flap with a superior hinge was successfully created using a microkeratome with the maximum head thickness (Hansatome zero compression; Bausch & Lomb; 200-µm head, suction ring with 9.5-mm inner diameter). A new blade was used for each cut. After lifting the flap, the corneal inlay was placed centrally above the pupil and the flap was repositioned (Video 1, available in the online version of this article). Both patients denied eye rubbing after implantation. A 34-year-old patient presented with preoperative refraction in the right eye of +8.50 −1.00 × 20° with a corrected distance visual acuity (CDVA) of 0.8. Minimum corneal thickness was 546 µm. Postoperative recovery after implantation of the PermaVision lens was unremarkable; uncorrected distance visual acuity (UDVA) was 0.63 on day 1 and 3 months postoperatively. At 8 years after implantation, there were no morphologic problems (Figure 1A). However, refraction was more hyperopic again (+4.50 −1.00 × 107° = 0.9). (A) Corneal inlay 8 years after implantation. (B) Corneal inlay with partial flap melt 9 years after implantation and immediately before explantation. (C) Cornea 1 day after explantation. (D) Cornea 4 days after explantation. (E) Cornea 2 weeks after explantation. (F) Cornea 4 weeks after explantation. (G) Cornea 2 months after explantation. (H) Cornea 1 year after explantation. One year later (9 years after implantation), the patient complained about loss of vision. Slit-lamp examination revealed a sector-shaped flap melt from the 1- to 2-o'clock positions with the bare inlay protruding in this area (Figure 1B, Figure 2). The inlay was immediately explanted to avoid infection and the epithelium adjacent to the stromal defect was removed to avoid epithelial ingrowth. Ofloxacin eye drops (Floxal EDO; Dr. Mann Pharma, Bausch & Lomb, Berlin, Germany) were prescribed until epithelial closure. The epithelium healed uneventfully. The corneal interface was densely opaque after explantation (Figures 1C–1F) and showed marked irregularity. Dexamethasone eye drops (Dexa EDO; Dr. Mann Pharma) were prescribed four times a day and tapered over 2 months. After that time, the cornea was slightly less opaque (Figure 1G). Anterior segment optical coherence tomography (Spectralis OCT; Heidelberg Engineering, Heidelberg, Germany) displaying flap melt immediately before explantation of corneal inlay. One year after explantation, the corneal surface was less irregular but vison remained poor. The cornea recovered slowly (Figure 1H). Three years after explantation, CDVA was 1.0 with a significant hyperopic shift (+11.25 −1.25 × 31°), but there were still some opaque areas in the cornea. Four years after explantation, a refractive lens extraction yielded excellent UDVA (0.8). A 26-year-old man presented with preoperative refraction in the left eye of +6.75 −1.50 × 76° with CDVA of 1.0. Minimum corneal thickness was 571 µm. Perma-Vision lens implantation was successful with UDVA of 0.8 on day 1 postoperatively. All follow-up visits up to 6 months yielded unremarkable findings and stable vision. After 7 years, the patient returned because of loss of vision (UDVA 0.32). Slit-lamp examination revealed haze anterior to the corneal inlay (Figure 3A). Dexamethasone eye drops once daily for 2 months were prescribed with little success. (A) Corneal inlay 7 years after implantation. (B) Corneal inlay 11 years after implantation with epithelial and stromal defect. (C) Cornea 1 day after explantation. (D) Cornea 2 weeks after explantation. (E, F) Cornea 3 months after explantation. One year later, UDVA remained poor (0.32) because the refractive effect of the inlay had diminished (objective refraction: +4.25 −4.75 × 84°), and its shape was slightly irregular. We recommended removal of the inlay, which the patient declined. Instead, he returned 2 years later (11 years after implantation) because of typical symptoms of recurrent erosions. Slit-lamp examination revealed an epithelial and stromal defect (Figure 3B) and severe deformation of his inlay (Figure 4). The inlay was explanted. The cornea recovered slowly (Figures 3C–3D). Three months after explantation, a substantial stromal defect was still visible (Figures 3E–3F). Two years after explantation, CDVA was 0.8 (refraction: +4.75 −1.0 × 70°), but the corneal opacities remained unchanged. Anterior segment optical coherence tomography (Spectralis OCT; Heidelberg Engineering, Heidelberg, Germany) showing deformed inlay before explantation. A corneal inlay was also implanted in the fellow eyes of both patients. Case 1's inlay in the fellow eye displayed a regression of the refractive effect without flap melting and was explanted 13 years after implantation before a refractive lens exchange was performed. Case 2's corneal inlay in the fellow eye was revised after 1 month and removed after 3 months due to persistent monocular diplopia. LASIK (intended correction +6.00 D) was performed 6 months after explantation. The correction of refractive errors with synthetic additive implants is a concept described by Barraquer4 more than 50 years ago, when he inserted flint glass into the cornea. However, flint glass displayed low bio-compatibility and corneal inlays made from hydrogel were developed that showed better results with fewer complications.2,5,6 The PermaVision intracorneal lens has a high water content of 78% and is permeable to water, oxygen, and glucose,5 theoretically offering superior biocompatibility. There are several reports on the safety and efficacy of PermaVision intracorneal lenses. Ismail7 showed a relatively stable and predictable refraction for moderate hyperopia without major complications over 2 years of follow-up. Lens opacification and stromal haze were the most common complications. Other studies reported a high explantation rate with a follow-up time of 38 and 59 years, respectively. Verity et al.8 removed 14 of 15 inlays. Interestingly, 1 implant was removed after 1 year because of corneal flap melting, which the authors assumed to represent a neurotropic phenomenon. Mulet et al.2 removed 20 of 24 inlays due to undercorrection, reduced vision, haze, implant decentration, or perilenticular opacity. 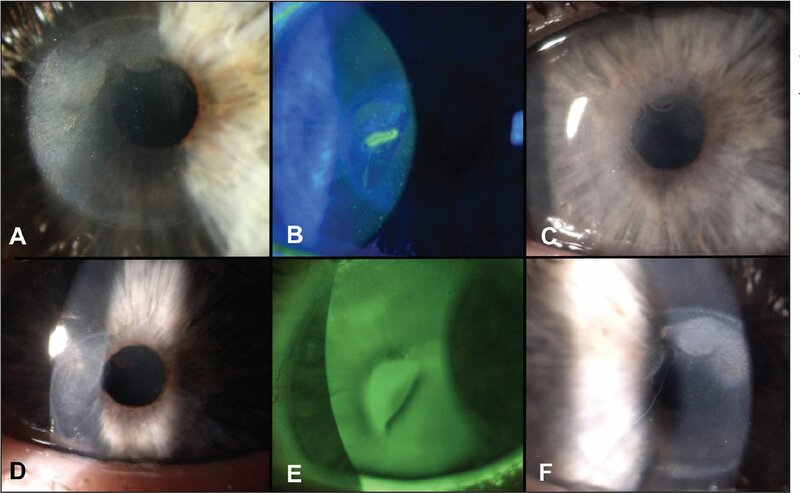 We described two cases of full-thickness flap melting over a PermaVision intracorneal lens following loss of refractive effect and treatment-resistant haze formation. Both occurred despite excellent initial results after a longer follow-up time than evaluated in other reports. One may speculate whether the outcomes would have been different with modern techniques. We have previously described that the 200-µm microkeratome head typically results in a significantly lesser flap thickness.9 Today, most surgeons advocate placing inlays deeper into the stroma using a femtosecond laser. PermaVision lenses were no longer commercially available soon after we had started using them in 2004 in a total of 4 eyes of two patients. Recently, there has been renewed interest in corneal inlays, this time for presbyopia correction. These inlays differ in materials, designs, and surgical techniques from the cases we describe, which may improve their physiologic acceptance to an even higher level. However, they are placed in the same metabolically active part of the eye and parallels to our cases may exist. 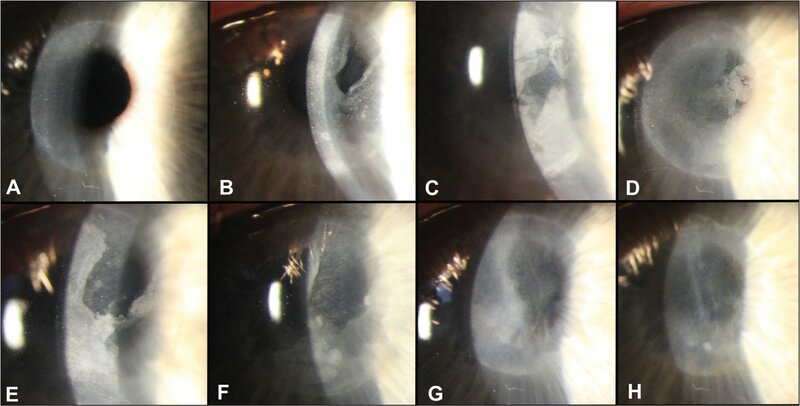 We reported two cases of corneal flap melting several years after inserting a corneal inlay for hyperopia correction. These late-onset problems suggest the need for patient education in this regard and long-term monitoring of inlays on a regular schedule. Barraquer JI, Gomez ML. Permalens hydrogel intracorneal lenses for spherical ametropia. J Refract Surg. 1997;13:342–348. From Zentrum fur Refraktive Chirurgie Muenster, Muenster, Germany (ST, SK, AR); and Ruhr-Universität Bochum, Bochum, Germany (TS, HBD).